It was 1993 (I think), the Gemini Awards, and I had my first (and only) TV appearance. 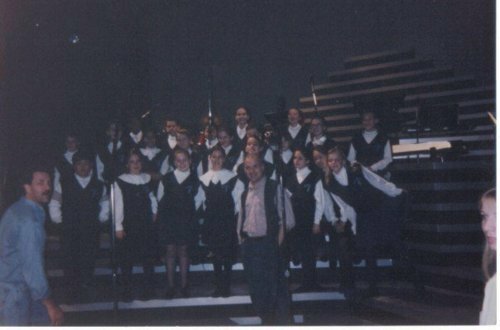 I was one of 20 students that passed an audition to be part of a back up choir for Cerdic Smith’s song Children of the Island. Sarah Polley played the flute. I was 11 years old. I watched Road to Avonlea and I’m sure I’m not alone to say that I had a crush on Felix King, played by Zachary Bennett (who is now also a musician). I met Mag Ruffman; she’s super nice; and is now the Tool Girl. It was all very exciting, being lead through “secret” tunnels to a backstage holding area at Toronto’s Metro Convention Center. It must have felt like a surreal dream because I only remember bits and pieces of it. There was a woman with over the knee boots sported in a certain 1990 film…random fact. Fast forward a *few* years. On Tuesday I’m going to a taping of Toronto’s Talent (Rogers TV). I won’t be in a choir of 20, I won’t be star struck waiting for the elevator as Zachary Bennett walks by (I’m going to laugh if he ever reads this blog), and I most likely won’t be ushered through “secret” passageways. But I know it’ll be magical non-the-less. I’ll be playing my own song and talking about my music. Eighteen years ago, when I stepped onto that stage, did I ever think I’d be the one performing a song on television? Not in my wildest dreams. Was a great performance. Its now available on YouTube.